I started my Neighborhood Council filled week on Sunday at the Chatsworth Neighborhood Council's 12th Annual Day of the Horse. It was a fun filled equestrian event co-hosted by Councilmember Mitch Englander. I even walked away from with a great outreach pen in the shape of a horse head. Love it! I met with Emergency Management Department General Manager James Featherstone on Monday to talk about how Neighborhood Councils could assist in the City's emergency preparedness efforts. We discussed continuing some great partnerships that already exist between EMD and Neighborhood Councils, such as collaborations with their 5 Steps to Neighborhood Preparedness program. Jim agreed that Neighborhood Councils could be key in preparing neighborhoods for disasters. I'll be following up with the Neighborhood Councils about next steps particularly in light of Mayor Eric Garcetti's Resilence by Design earthquake report. Speaking of Mayor Garcetti, I was happy to be with the packed audience at Cal State Northridge's Valley Performing Arts Center to hear his State of the City address. As usual, Mayor Garcetti was very inspiring, and there was excitement in the air as he shared his plans for Los Angeles. It was great to see many Neighborhood Council leaders among the audience. 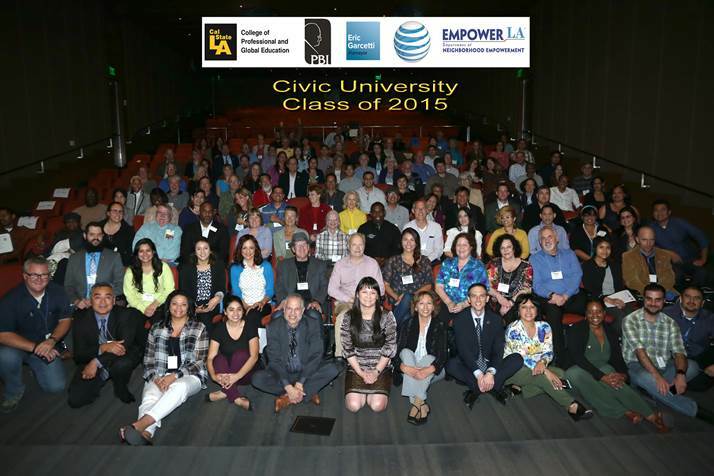 Part of Mayor Garcetti's vision for empowering Angelenos came to a wonderful conclusion on Wednesday night as the first (and hopefully one of many) Neighborhood Council Civic University class graduated with over 100 students from Neighborhood Councils across the city. This was a first time collaboration by Mayor Garcetti's Office, the Pat Brown Institute of Cal State Los Angeles, the Board of Neighborhood Commissioners and our Department of Neighborhood Empowerment, and I can say it was a huge success. Raphael Sonenshein, the Executive Director of the Pat Brown Institute, received a well deserved standing ovation from the students for his insightful and witty lectures over the course of 3 nights. Graduates received their certificates of completion and mingled at a reception afterwards where everyone was talking about how all Neighborhood Council members should take the class as well as when the next "masters level" class would be. We're hoping to continue this collaboration with more classes in the near future. Tomorrow is a jam packed day with Neighborhood Council happenings around Los Angeles: United Neighborhoods Neighborhood Councils will be hosting their Public Safety Summit; Studio City Neighborhood Council will present their Green Fair; Los Feliz and Silver Lake Neighborhood Councils are co-sponsoring their Spring Faire; newly certified Zapata-King Neighborhood Council will be holding their selection for their board; Neighborhood Council Budget Advocates will be meeting; and I'm excited to be speaking about the Neighborhood Council system at the Empowerment Congress Leadership Institute in the morning. If I don't see you, have a relaxing weekend! Mayor Eric Garcetti and Councilmember Paul Krekorian cordially invite the public to a centennial commemoration of the Armenian Genocide.